Prince Gamini was born to a royal family in southern Lanka. His parents were King Kakavanna Tissa and Vihara Maha Devi. Mahanaga was the brother of King Devanam Piyatissa. Mahanaga was second in line to the throne. One of the wives of King Devanam Piyatissa, decided to kill Mahanaga in order to get the crown to her son after King Devanam Piyatissa. At that time Mahanaga was constructing the Tharachcha reservoir. One day Mahanaga and the little Prince were planning to go to the Tharachcha reservoir and the queen gave a basket of mangoes to Mahanaga. She kept one poisonous mango on the very top of the basket thinking that poisonous mango would be eaten by Mahanaga. Unfortunately little boy ate the mango and died. Mahanaga was terrified and ran away to Southern Lanka. Mahanaga found refuge in Yaththalaya Vihara in Galle. 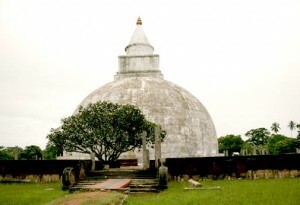 In this vihara, Mahanaga’s wife gave birth to a son and was named Yatthalayaka Tissa. (Author’s note: This vihara still exists and today known as Yatagala vihara in Mataramba, Galle. This is a very beautiful vihara and lies under a large rock.) In time Mahanaga became the ruler of Rohana. Mahanaga constructed a dagaba (A Buddhist structure) near Magama river. After Mahanaga, his son Yatthalayaka Tissa became the King of Rohana. After Yatthlayaka Tissa, his son Abhaya became the ruler of Rohana. After Abhaya, his son KakaVanna Tissa became the ruler of Rohana. (KakaVanna Tissa is better known in Sri Lanka today as Kawan Tissa). While Kaka Vanna Tissa was ruling Rohana, Kalani Tissa was ruling the Kalani area. Kalani Tissa had a brother named Uttiya who had a secret relationship with Kalani Tissa’s wife. When Kalani Tissa found out about the relationship, Uttiya ran away and hid among the people. One day Uttiya sent a man dressed as a Buddhist monk hidden among other monks. The man came near the queen and dropped a letter. King heard a slight noise and found the letter. King thought the letter was dropped by one of the Arahath Theras (Arahath = Achiever of Nirvana, Thera = Buddhist monk) who was standing nearby and killed the monk by putting him inside a hot oil caldron. The gods got upset from this heinous crime and ocean started to flow into land. After consultation of the ministers, King Kalani Tissa decided to send his beautiful daughter Vihara Devi (Later she became known as Vihara Maha Devi) in a ship to satisfy the gods. The ship carrying Vihara Devi landed in Rohana and was found by Kaka Vanna Tissa. He was impressed with her beauty and married her. In time, a Prince was born to the King and the Queen and they named him Prince Gamini. The King invited twelve thousand monks for the name giving ceremony of Prince Gamini. King Kawan Tissa prepared milk rice for the monks. (Author’s note: Milk Rice (Kiri bath in Sinhalese) is still commonly prepared in modern Sri Lanka. Kiri bath is a mixture of coconut milk and rice. It is possible that milk rice during King Kawan Tissa’s time was no different than today’s “Kiri bath”). In time, a second son was born to the King and he was named “Tissa”. Three Vows: When Prince Gamini was twelve and Prince Tissa was ten years old, King Kawan Tissa, brought them to his room. King had three small portions of rice in a dish for each Prince. The King said that they would be taking three vows today and they should never be broken. King asked the boys to take the first Vow and eat the rice portion in front of them. “We will not do any harm to monks”Boys took the first Vow and ate the rice portion. King asked the boys to take the second Vow and eat the rice portion. “ We will not fight with each other”Boys took the second vow and ate the rice portion. King asked the boys to take the third Vow and eat the rice portion. “ We will not fight with Damilas”Both boys refused to take the third vow. Both of them left the room. Prince Gamini went to his room and slept all curled up. Mother Vihara Maha Devi came to his room and asked why he is sleeping curled up in a large bed and why not stretch out and sleep comfortably. Then Prince Gamini stated “On one side there is the dumb ocean and on the other side beyond the river there are Damilas. How can I stretch out and sleep comfortably”. When King Kawan Tissa heard these remarks, he remained silent. Prince Gamini grew vigorous and strong. King Kawan Tissa stationed Prince Tissa in Dighavapi away from Rohana to protect Dighavapi from any enemy attack. At this time Prince Gamini was under the impression that it is time to go to war with King Elara. But King Kawan Tissa thought otherwise. Prince Gamini asked the King three times and all three times King refused. Prince Gamini was frustrated and sent female garments to his father. This angered King Kawan Tissa and Prince Gamini ran away to Malaya country (hill country). After this incident, people called him “Dutta Gamini” or “Angry Gamini”. Later the name was simplified to “Dutugemunu”. At this point, King sensed that there could be a battle between Gamini and Tissa. King summoned all ten giants and asked them to promise him that they would be neutral in a war between two brothers. Ten giants promised to stay away from any battle between two Princes. King Kawan Tissa built sixty four temples and lived sixty four years and died. Not a very filled story, but fine enough. The story is intresting, but information about dutugamunu is not enough, what happen to him next?